The first-ever World Class Bar brings the high standards of “fine dining” to the spirited world of cocktails. Welcome to our “fine drinking” experience, where the rituals of making your cocktail are just as exciting as drinking them. Artfully crafted creations will introduce you to flavors so unexpectedly delicious, your palate will sing for more. Using the freshest ingredients and the finest spirits, our expert mixologists will find exciting ways to satisfy both the curious newcomer and the connoisseur. A luxurious, new Michael Kors boutique joins an already superb assortment of shops onboard Celebrity Eclipse. Here you’ll find a spectacular assortment of handbags, wallets, watches, glasses, jewelry and more. And, did we mention it's all tax and duty-free? Picture this—a new way to capture vacation memories. Strike a pose in our new, high-end portrait studio for a truly personal souvenir. This unique space is ideal for capturing vacation photos with friends, family, and loved ones. Try a bold collection of both familiar and unknown wines from around the world in this inviting wine bar. To help you explore, we feature the state-of-the-art Enomatic® wine-by-the-glass dispensing system. It will pour your choice directly from the bottle in a 1-ounce, 2.5-ounce or 5-ounce portion as you swipe you SeaPass® card. Our Sommeliers will offer further insight into the fine art of wine selection. Every hour of your vacation should be lived to the fullest. From morning until night Celebrity will introduce you to an exhilarating and exciting series of activites that redefine traditional onboard programming. Every day can be different as you try out countless culinary, enrichment and wellness programs, from learning Pilates to discovering how to create the perfect Mojito. Spend the day lounging by the pool with a great read, while the pool butlers bring you a cool towel and an icy tropical drink. Pampering yourself with a relaxing massage in the super luxurious AquaSpa. The crowd-pleasing entertainment program keeps you captivated day and night. Be mesmerized by Broadway inspired shows. Let the DJs keep you dancing all night long. Or join in the fun at one of the interactive theme parties. There are 24 hours in the day and not a dull moment to any of them when you sail with Celebrity. This gratuity is shared by the stateroom attendant, dining services staff, and housekeeping staff members, who help enhance guests' vacation experience. The gratuity payments may be adjusted onboard at Guest Relations at guests' discretion, in which case they will not be automatically added to the onboard SeaPass® account. An 18% gratuity will be automatically added to all beverages, mini bar purchases, spa, and salon services. Additional gratuities may be added at guests' discretion. Internet access is available in the Internet Café 24 hours a day until debarkation is completed. Guests can also connect to the Internet on each ship in the Celebrity fleet, either by accessing a 24/7 wireless connection "hotspot", or utilizing the resources of the Internet Café located onboard. Depending on class of ship, you can access the Internet from your stateroom. On Solstice Class chips, the full ship is wireless; on Millennium Class ships you may be able to access wireless service from your stateroom based on where the closest hotspot is located. You will be able to receive email, via satellite link 24 hours a day, satellite conditions permitting. There is also an Internet Manager on board to assist you. Celebrity Cruises cannot accept guests who will have entered their 24th week of pregnancy by the beginning of, or at any time during their cruise vacation. A physician's "Fit to Travel" note is required prior to sailing, stating how far along (in weeks) your pregnancy will be at the beginning of the cruise and confirming that you are in good health and not experiencing a high-risk pregnancy. The "Fit to Travel" note should be faxed to the Access Department at 1-954-628-9622. If you have already booked a cruise or Cruisetour and do not meet this requirement, please call Celebrity at 1-866-592-7225 or email them at info@specialneedsgroup.com. For the comfort and enjoyment of all guests, Celebrity ships are designated as non-smoking. However, Celebrity does recognize that some guests smoke. Therefore, cigarette, cigar and pipe smoking is permitted in designated outdoor areas of the ship. Smoking is not permitted in any dining venue, casino, theater, lounge, hallway, elevator or corridor. This policy includes smoking-like products such as electronic cigarettes. Smoking is not permitted inside any guest stateroom, nor on any guest veranda. If a guest is in violation of this policy, a cleaning fee of $250USD will be applied to their SeaPass account and the guest may be subject to further action pursuant to the "Consequences Section" of the Guest Conduct Policy. Cigarettes, cigars and pipe tobacco must be properly disposed of and never thrown overboard. A guest must be at least 18 years of age to purchase, possess or use tobacco onboard. Additionally, there is a non-smoking policy on all components of the land tour portion of all Celebrity Cruises cruisetour products. Celebrity Cruises is happy to accommodate many different kinds of dietary needs in the Main Dining Room to enhance your cruise vacation. Once you have booked your cruise, send your special dietary request to SpecialNeeds@celebrity.com or call 1-866-592-7225. Celebrity's entire team is extensively trained to handle these special needs. Just speak with your Maître d' onboard and he or she will ensure your requirements are met. In the Marketplace, speak with the Manager who can answer any of your questions about ingredients in the dishes. Celebrity offers a separate 14-day Vegetarian Menu that also contains at least one Vegan Selection in every category (appetizers, soups, salads, entrée) each night of your vacation. Look for the leaf icon to find the vegetarian dishes on the Main Dining Room menu. In addition to the current selection of complimentary kosher meals, there is also a selection of Premium Kosher Meals. High quality, made-from-scratch dishes are Glatt Kosher certified and prepared under the strict supervision of the O.U. and USDA. Pricing is per item and prices are subject to change. If you wish to partake of either the standard or premium kosher meals, you must notify Celebrity 60 days in advance of your departure date. Premium Kosher Meals must be ordered onboard 24 hours in advance. To accommodate guests with sensitivity to sugar, there is a selection of delicious, mouth-watering desserts with no added sugar. Available in all the onboard restaurants. Just look for the diamond symbol on the menu. Lactose-intolerant? Need baby food? Or gluten-free dishes? Just ask and Celebrity will do their best to provide you with delicious alternatives. Celebrity is committed to providing all its guests with an unrivaled cruise vacation. Their extensive attention to detail will make your vacation one that knows no boundaries. 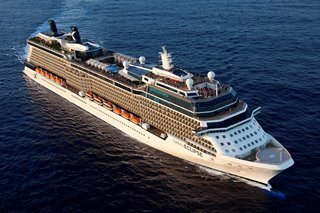 Guests requiring continuous ambulatory peritoneal dialysis are welcome to board all Celebrity Cruises vessels. However, Celebrity Cruises does not have the ability to assist or administer hemo-dialysis treatments. Guests should have all solutions and equipment needed to perform the dialysis delivered to the vessel on the day of sailing at least two hours prior to sailing. Please contact Celebrity for more information on policies and procedures. All types of oxygen are permitted onboard. Please notify Celebrity as to quantity, type and delivery schedule. Each vessel has a different storage policy. However, you will be able to keep some or all of your cylinders in the stateroom. Every ship in the Celebrity fleet was designed with every guest's need in mind. You'll find wide, spacious corridors, to allow 180° turns for wheelchairs. Most decks are accessible through automatic doors, and all public rooms feature entrances with gradual inclines. Celebrity will provide complimentary wheelchair assistance for embarkation and disembarkation only. Guests may bring and use wheelchairs, mobility scooters and other assistive devices onboard the ships. Due to safety regulations, Segways may not be used onboard. Assistive devices should fit through a standard stateroom entry doorway which is at least 23 inches wide. Celebrity offers accessible staterooms which have wider doorways measuring at least 32 inches wide and may accommodate larger devices. If you have an assistive device larger than 32 inches wide, please contact the Access Department for assistance. Accessible staterooms are designed with wider doors, roll-in showers, grab bars and other special features for guests with mobility disabilities and other disabilities that require the use of the accessible features of that stateroom. Accessible staterooms are held for people with disabilities until all other non-accessible staterooms in that category are reserved. Upon reserving an accessible stateroom, Celebrity requires that guests acknowledge the need for the accessible stateroom by completing a Guest Special Needs Form. If a guest is booked in an accessible stateroom and they do not have a mobility disability or other disability that requires the use of the features that are provided in the accessible stateroom, they may be moved at any time to a non-accessible stateroom in order to accommodate a guest with a disability. Please note that Celebrity will investigate and take action on potential misuse of accessible staterooms where there is good cause to believe that such staterooms have been booked fraudulently. For additional information, contact the Access Department at 1-866-592-7225 (voice), send an email to special_needs@celebrity.com, or have your travel professional contact Celebrity. Airport Transportation - If requested in advance, Celebrity can arrange for accessible transportation to transfer guests between the airport and the pier. This service is offered at no extra charge to their air/sea guests or those who have purchased cruise-only transfers. Accessible transportation may be limited or not available outside the U.S. Contact your travel agent or Celebrity for details. Extra Assistance at the Pier - Celebrity Cruises offers boarding and departure assistance with wheelchairs to guests with mobility disabilities. Request assistance once you arrive at the pier or contact Celebrity prior to your cruise so that they may prioritize your assistance to go onboard. During peak times there may be a wait for assistance. Many ports provide easy access for wheelchairs and scooters. However due to various conditions - such as steepness of the gangway, tendering, weather, tidal and sea conditions, and shore-side facilities - guests using assistive devices may be precluded from getting on or off the ship. Celebrity will make reasonable efforts to assist guests, but for safety reasons, their staff is not permitted to lift guests or equipment. Assistance with manual wheelchairs, walkers, canes, etc. will be provided. Assistance Onboard - Celebrity will provide reasonable mobility assistance to guests in accessing areas of the ship that are not accessible. Traveling from Ship to Shore - At some ports, the ship will anchor off shore, and guests are taken to shore by small boats called tenders. Even if the ship is scheduled to dock at a pier, it can change to tendering. Guests with assistive devices who are unable to take a few steps will be unable to board tenders unless roll-on capability is available. In order to safely board most tenders, guests must be able to take steps and use a collapsible manual wheelchair. In addition, motorized wheelchairs and mobility scooters can not be taken on tenders, unless roll-on capability is available. Inquire about tender roll-on capability at the Guest Relations Desk while on board. Please note roll-on capability is not guaranteed. Weather, sea conditions and other factors may preclude tendering. Safety of the guests and crew is the primary consideration, and the Captain and his staff will make the final decision regarding transferring guests and their assistive devices based on safety reasons. If guests are unable to tender or disembark due to these circumstances, there will be no refund or credit for missed ports. While Celebrity recognizes your disappointment, the safety of guests and crew takes precedence. Celebrity accommodates guests who are deaf and hard of hearing by providing them with technological advancements wherever and whenever possible. To customize your accommodations to meet your specific needs, please request and complete the Guest Special Needs Form from Celebrity. For additional information, contact the Access Department at 1-866-592-7225 (voice), send an e-mail to special_needs@celebrity.com, or contact your travel professional. A portable room kit in your stateroom is available upon request. It includes a visual-tactile alert system that provides alerts for door knocking, telephone ringing, alarm clock and smoke detector. A TTY (teletypewriter) in your stateroom is available upon request. The TTY in your stateroom interfaces with the TTY at the Guest Relations Desk to meet all your in-stateroom needs. Amplified telephones are available in the staterooms and public areas on Solstice class ships. Assistive Listening Systems are located in the main theatre on Solstice class ships. Sign language interpreting services will be provided upon request for deaf guests who use American Sign Language (ASL) as their primary means of communication. Sign language interpreting services are provided for main production shows, port and shopping presentations and other major activities on a shared basis for all deaf guests onboard. A request for sign language interpreting services should be made with the Access Department at time of booking but no later than 60 days prior to sailing. Requests are subject to availability of interpreters. Sign language interpreting services are provided on cruises that depart from and/or return to the U.S. and Canada. 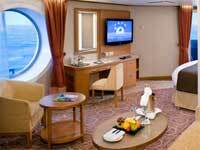 Closed-captioned televisions are available in all staterooms across the fleet. Please note that only select programs are captioned. All safety videos are captioned. Celebrity has made the cruise experience as effortless as possible for guests who are blind or have low vision. Some Celebrity ships incorporate Braille in public areas and elevators. As always, crew and staff are on hand to assist in every way at any time. To customize your accommodations to meet your specific needs, please request and complete the Guest Special Needs Form from Celebrity. For additional information, contact the Access Department at 1-866-592-7225 (voice), send an e-mail to special_needs@celebrity.com, or contact your travel professional. Service animals are welcomed onboard all ships except those sailing to the United Kingdom (UK) due to DEFRA regulations. A relief area measuring 4 feet by 4 feet, with cypress mulch, is provided. Additional information below. Qualified Readers: Select crew members have been trained as Qualified Readers to read written material such as the daily Celebrity Today newsletter and shore excursions information. Waiters will also read dining menus upon request. To request Qualified Readers for your cruise, please contact Guest Relations upon boarding. Braille/tactile signage on Solstice-class ships, Celebrity Constellation and Celebrity Infinity. Braille elevator buttons/audio call signals on Solstice-class ships, Celebrity Constellation and Celebrity Infinity. Celebrity warmly welcomes service dogs on all ships except those sailing to the United Kingdom (UK) due to DEFRA regulations. Please note: pets are NOT permitted onboard. A service dog is defined as "any dog that is individually trained to do work or perform tasks for the benefit of a person with a disability." Service dogs are not considered pets. Evidence that a dog is a service dog is helpful, but not required (such as identification cards, other written documentation, presence of harnesses and/or tags or the credible verbal assurance of the person with a disability using the animal). Celebrity will provide 4 feet by 4 feet relief areas with cypress mulch to accommodate service dogs. 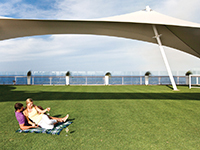 Sod for sailings from the U.S. can be provided if requested in advance and is available. Relief areas are provided on a shared basis with other service dogs onboard. Please note that The Lawn Club on Solstice class ships is not designated as a relief area. Please notify the Access Department at time of booking, but no later than 30 days prior to sailing, if a service dog relief area is needed. Service dogs are permitted to accompany the person with a disability in all public areas, including dining venues. While in public areas, service dogs must be on a leash, harness, or other restraining device. Due to health regulations, service dogs are not permitted in pools, whirlpools or spas. Care and supervision of the service animal is the sole responsibility of the owner. The ships are not required to provide food or care for the animal. Guests may bring a reasonable quantity of food and bowls for the dog onboard the ship at no additional charge. If refrigerated space is needed, notify the Access Department at time of booking, but no later than 30 days prior to sailing. Guests are responsible for obtaining all required permits for service dogs to depart the ship in non-U.S. ports. Guest must carry a copy with them on the ship, and leave a copy with the Guest Relations Desk after boarding the ship. To obtain specific information on required documents for service dogs, please visit the U. S. Department of Agriculture's website. All documentation and immunization requirements are established by government authorities and not Celebrity Cruises. Please note requirements are subject to change without notice. If the guest chooses to disembark the ship at a port at which the service dog must remain onboard, the guest must make arrangements to ensure that the dog is cared for. Note that the ship's staff is not required to care for the dog, nor can the dog be left in the stateroom unattended. Every Celebrity ship has an onboard medical facility staffed by a minimum of one physician and two nurses. All medical staff onboard are fully licensed. Celebrity vacations are all about wrapping you in modern luxury and transporting you beyond the ordinary. Celebrity offers the most sumptuous accommodations you can imagine. Their world-class staterooms are designed to be a study in forward-thinking, beautiful craftsmanship and innovative storage. Private verandas and suites offer breathtaking views and room for a private meal or morning coffee. Wrap yourself in extra-plush towels, sleep in the comfort of 100% cotton linens, and keep warm with thick down comforters. And the aquatic spa therapy toiletry collection, created exclusively for Celebrity's guests, was designed to bathe you in luxury. Information provided within these pages has been updated as of January 2019. 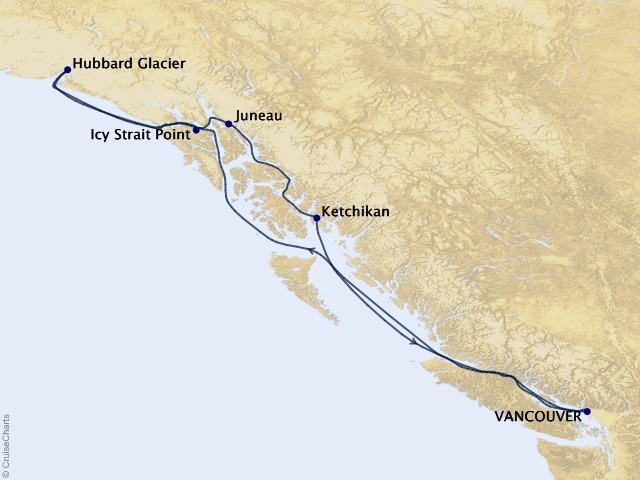 While we do our best to ensure that stateroom descriptions and deckplans appearing in this website are complete and accurate, we cannot be responsible for inaccurate representations, which may or may not be under our control. Please reconfirm stateroom accommodations and deck placement prior to booking. Rates are cruise only, per person, based on double occupancy. Taxes, Fees and Port Expenses of $187.83 additional for all guests. Rates are subject to availability and may change without notice. Restrictions may apply.